This here’s a photo of what Montreal looked like back in the early 1930s. To situate yourself, first you’re looking ‘Montreal east’ – that’s the Jacques-Cartier Bridge under construction, and by my guess I think the airplane was flying near the intersection of Rue de la Montagne and Boulevard Saint-Jacques, or Mountain and St. James as it was colloquially referred to back then. This is Montreal right before the Depression really began to be felt in Canada, and right after about fifty years of considerable and near constant economic growth for our city. This is Montreal back when Canada had but one metropolis. This is Montreal back when it defined what metropolis meant in the Canadian context. If you stare at this photo long enough you’ll see all that remains, and there’s a lot all things considered. But consider as well that just about everything in the lower half of the photo is gone. You can see the transition here (not my work, but hat’s off to the responsible party). In the contrast you can see the effect of monumental construction projects and just how much space is actually eaten up by the Ville-Marie Expressway. The depopulation of the central core of our city is clear, but so too is the amount of space we demand on an individual level also glaringly apparent. Back in the 1930s there was a lot more happening, so much more life, packed tighter together. At the top of the picture is more-or-less the limit of the ‘urban’ montreal of the day, and it wouldn’t have extended much father in other directions either. This is back when NDG was the suburbs. Montreal’s population was recorded at just under one million people in 1931, and you can imagine the majority of those people would have lived and worked in the area photographed above. Montreal witnessed a steady decline in population between 1971 and 2001, from our all-time high of 1,766,000 to 1,583,000 at the start of the new millennium. The city lost 183,000 people, largely to suburbanization, during that thirty-year period. Concurrently, the city deindustrialized (as other major North American cities did at the time) and gave up considerable tracts of land to highways and parking lots, facilitating the new white collar workers who worked in the new corporate office towers of the urban core. It’s unfortunate, because we’ll never have this kind of urban density again, and as a consequence I doubt we’ll ever be able to truly replicate the urban lifestyle aesthetic of our first metropolitan era. This is downtown Montreal at the beginning of the 1960s. Here you can see the effect cars had on redesigning the city, as what was once an elegant and small street (Dorchester) was transformed into a major urban traffic artery. Dorchester, now Boul. René-Lévesque, was widened starting in the mid-1950s to make way for the new commuter class driving in from neighbourhoods located much farther away than had ever previously been convenient. As ‘Gilded Age’ mansions were torn down they were replaced with massive new buildings, such as the Tour CIBC (seen above, the slender slate-grey tower), Place Ville-Marie etc. Hand-in-hand with the redevelopment of Dorchester came the construction of a major east-west highway, today known as the Ville-Marie Expressway. The Ville-Marie was a success in one manner of thinking because so much of it was put underground (as opposed to above ground, such as Metropolitan Boulevard north of the mountain), meaning it could be eventually covered over again. Unfortunately this took a lot longer and had a more deleterious effect than city planners had imagined. In the 1960s, when planning and construction of the Ville-Marie began, there was this idea, as you can see in the above rendering, that the new ‘sunken’ highway would take the form of a post-modern canal, stimulating new growth immediately next to it. This didn’t really happen as developers were disinclined to build right next to an open highway trench. Moreover, planners back in the 1960s failed to realize just how unappealing an open highway trench would actually be for all the people walking around above. This is what the Ville-Marie looked like right before the first serious efforts to recover the lost land actually began. Notice that parts weren’t completely open – the tunnel roof is visible – but that for whatever reason no efforts had been made to reclaim this space. This would change at the start of the new century with the planned redesign of Victoria Square and the development of the Quartier Internationale. During 2002-2003 the square was completely redesigned, concurrently with the construction of the CDP Capital Centre, the enlargement of the Palais des Congrès and the construction of Place Riopelle between the two. All of this was located atop the tunnel. The CDP Capital Centre is particularly impressive (and I’d encourage you to visit it during normal business hours) as the architect designed a building that sits atop the tunnel but doesn’t place any weight on it – the atrium is in fact located directly above the tunnel, with the weight of the building pushed off on to either side. At around the same time, the Underground City was extended to connect the once separate eastern and western axes through this area. Arguably the most impressive and least used parts of the RÉSO can be found here. So clearly it is possible to build on top of the tunnel/trench. The question comes down to cost. This is the remaining open part of the Ville-Marie Expressway, between the new CHUM superhospital and the Palais des Congrès. As you can see, it’s a considerable amount of space. Mayor Denis Coderre wants to build a park atop the highway trench on the easternmost portion. Transport Quebec, the provincial transport ministry, has said, unequivocally, no. They argue it will cost too much without giving any idea as to what they think it will cost. This is called ‘convenient political obstructionism. It isn’t the plan they don’t like, it’s that the Mayor of Montreal is planning it and, for reasons that still make no sense to me, a highway used almost exclusively by Montrealers is outside the jurisdiction of City Hall. When the mayor can’t decide to build a park on top of a highway trench without running it through the often anti-Montreal Québec government, you know there’s a problem. And as to the other two-thirds of the trench, well, there’s enough space here to build an entirely new Palais des Congrès (not that I’d advocate for another convention centre in the same space, but simply to illustrate just how much area we’re actually talking about). It strikes me as odd the city, province and various private developers couldn’t get together and devise a plan to cover over this remaining section. If costs are as prohibitive as the province seems to believe, then perhaps the recovering job ought to be a public-private partnership. Get private developers to front part of the cost so that they can get the rights to build above. Something tells me this would be an excellent location both for office towers and condominiums, given that this open hole happens to be in the middle of just about everything. I can imagine living and working here would appeal to a lot of people. The next phase – this is passed for a park on top of a highway in 1982; neat idea, poor execution, worse location. And just in case there’s any doubt it can be done, it has been done before. The Agora pictured above is probably one of our city’s least used (and enigmatic) public spaces because it’s terribly uninviting. Moreover, due to its design and the relative poverty of the surrounding area for far too many years, it was taken over by local homeless people. My first apartment in Montreal was right in front of it and throughout the summer the entirety of Viger Square was a makeshift homeless campground. The single biggest problem with the public spaces created above the Ville-Marie in the late 1970s and early 1980s is that lines of sight across the spaces are blocked by walls and hedges. I don’t want to see the Agora torn down because I think it might work very well in another part of town, but the fact remains, these places aren’t being used as best they can. Especially considering the creation of the Ville-Marie Expressway caused the stately Viger Square to be destroyed. What I’d like to see is large, green, urban parks with clear sight lines across, much like Viger Square before it was demolished to excavate for the Ville-Marie. Given the new housing built in the area in the last decade, I think it would be wiser to create a more traditional green space in this area and move the post-modern agora a little closer to the city centre. I think the agora would work much better in an area in which thru-traffic can be guaranteed and stimulated. This is simply impossible where it currently stands largely because it’s bounded by two major boulevards and there’s not much going on in its current location to stimulate the much needed ‘ballet of the streets’. All that said – this is our city, our highway, our public spaces and ultimately our problem. The effort to remove the scar left by our efforts to modernize fifty some-odd years ago has only been partially achieved. In order to build a more cohesive city, and further to beautify it and increase population density, we must be given the tools to be masters of our own domain. Cadillac Fairview corporation (the real estate arm of the Ontario Teachers’ Pension Plan, the single best performing pension plan in the entire world) has announced their intention to invest about $2 billion redeveloping a significant portion of downtown Montreal. They’re already building the 50-floor Tour des Canadiens and the new 26-floor Deloitte Tower on either side of the Bell Centre, and as a result of apparently high demand for more condominiums in downtown Montréal, are now proceeding with the next two phases of their overall master plan. Though Cadillac Fairview is cautious and are indicating, officially, that this is simply a proposal, they nonetheless appear confident the next phases will be realized. Phase II involves the construction of two 37-floor towers, one of which will be exclusively residential (with about 400 units) while the other will be mixed use, including a commercial base, a hotel and about 200 apartments. They’re to be built immediately south of the Bell Centre and will be feature a pedestrian bridge over St-Antoine Street. Phases III & IV would involve construction of between four and five new towers on two plots of land on either side of St-Jacques between Rue Jean d’Estrées and Peel, in effect linking the downtown core with Griffintown. See the area here. While I would assume these are to be condominium towers, Cadillac Fairview senior vice-president Salvatore Iacono stated that he believes Montreal has a market for new office space in addition to urban residential properties. I think he has a point too – we are lacking in class-A office space and most of our existing office towers were built in the 1960s, and most of our modern class-A buildings were built over 20 years ago. Aside from the Deloitte Tower currently being built, the Cité du Commerce Electronique and the Cité Multimédia are the last two significant office space developments, and those happened over a decade ago. 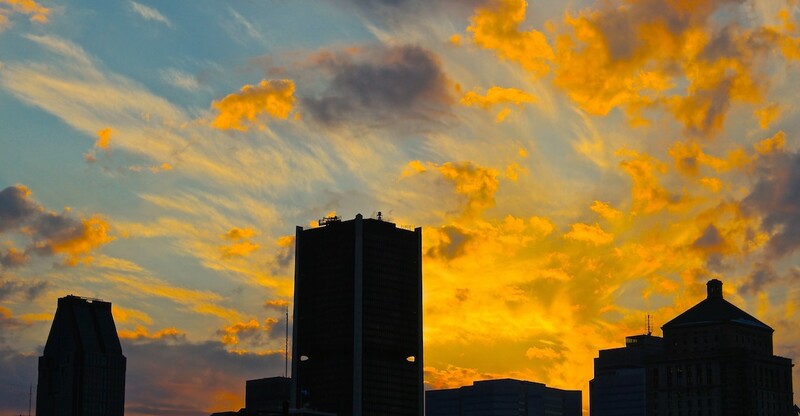 In any event, assuming all this works out Montreal’s skyline, and downtown, are going to change irrevocably, and with prudent civic involvement, for the best and for the city’s long term gain. I find many Montrealers are sceptical of all the new condo projects going up, and there seems to be a somewhat prevalent concern the market is already over-saturated, and that these new towers are going to be half empty. Perhaps our concern is unnecessary and/or is the result of massive construction in Toronto and Vancouver, two local real-estate markets regularly criticized for being excessively over-valued and unsustainable. We should remind ourselves that what’s going up in this city pales in comparison to developments in the country’s other major cities. I think we might be proceeding more cautiously and sensibly than many would give this city credit for. Consider this – most of the new towers that will soon redefine our city’s skyline are being built on unused land or parking lots; unlike a lot of other major downtown developments in our city’s history, nothing architecturally significant is being destroyed to accommodate these new towers. Consider as well, these buildings don’t get built unless at least 70% of units are sold first. So while there are many proposals, so far only the Tour des Canadiens, l’Avenue, Rocabella and Icone have past this necessary threshold to proceed with construction, though I’m not 100% certain both Icone buildings have been completely sold. And consider as well that these buildings are going to concentrate a lot of high value residential property right in the heart of the central business district, assisting in the city’s efforts to repopulate the urban core. As long as people continue working office jobs downtown, there will be a market for these condos. And each of these new condos brings in more tax revenue for the city. From an environmental perspective, these developments may help us breathe a little easier. I think these new condos are going to appeal to new generations of young urban professionals who would rather live within walking distance of their office than spend several hours a day driving to and from the suburbs. What’s more, these new condos are filling something of a gap in downtown real estate. Up until quite recently downtown real estate consisted almost exclusively of rental apartments of various prices and some of the most expensive homes in the city, without much in between. A lot of new condominiums coming into the market are affordable enough to be competitive with rental rates for similarly sized apartments in the city’s iconic inner-ring urban residential neighbourhoods. So it begs the question, why rent an apartment for $1200 a month when you can get a mortgage for less? Suffice it to say, I think these new towers are going to appeal to a lot of people and I’m looking forward to seeing how the city evolves around all these new residents. Now, that said, there are a few things the city can do to help see these projects realized, and to further help guard against the development of a ‘condo ghetto’. What we want to avoid is too much of the same thing, and the city could implicate itself by mandating a certain number of ‘family-sized’ units be developed (though if you review the plans of a lot of these new towers, many of them incorporate a variety of unit layouts and multiple closed rooms) and can further work to secure the services necessary for so many new urban residents. We don’t just want to populate the downtown core with young professionals, we want families too (because they’re more likely to stay). Ergo, space needs to be allocated for clinics, grocery stores, pharmacies, daycares, cultural and green spaces, community space and perhaps even a library and public school. A large geographic area of this city is being completely redeveloped (basically the area roughly bounded by Bleury, Ste-Catherine, Guy and the Lachine Canal), I think the city would be wise to lead development by working to provide the services necessary to sustain a large and diverse urban population. Free market capitalism will take care of part of this problem, but ultimately the responsibility will rest on the city to make sure a diverse population takes up residence downtown and can be sustained living in an area which, up until quite recently, has been unfortunately underpopulated. Further, the city could involve itself by developing new public green spaces, renovating the existing ones, and connecting as many of these new buildings directly to the Underground City. Being able to walk from your home to your office and back again without having to put on boots and a coat is going to appeal to a lot of people in this city. And who knows, maybe all the sudden availability of thousands of new condominiums in the next few years will serve to lower rents (the logic being that thousands of people will choose to own downtown property, vacating thousands of otherwise desirable apartments). My most immediate concern is that, despite all this new living space, there’s no cohesive affordable housing plan. Low-income earners have the right to quality, affordable housing, and this city seems to be lacking it. Now while none of these new condo towers are forcing anyone out of a home, to my knowledge they’re not providing any affordable housing space. If I recall correctly, there’s a provision in the local building code that stipulates new construction reserve a certain number of units to be classified as ‘affordable housing’ but there’s also a means by which developers can get around this, though the specifics escape me at the moment. From the looks of things, none of these impressive new buildings will feature subsidized housing, and affordable is an obviously subjective term. In addition, 1180 St-Antoine will be demolished to make way for the next phase of Cadillac Fairview’s Bell Centre project. While the building is quite ugly, in my opinion, and I have no earthly idea what it was originally designed for, it has become a vital focal point for many Montreal musicians. There’s quite a bit of rehearsal and recording space in the building, and it’s well used mostly because it’s quite cheap. It’s also a decent enough DIY venue for small concerts, a means by which a lot of bands support themselves. And as you might imagine, no plan to replace this lost space once the condominiums are built. It would be nice if someone stepped in and made the case that, whatever form this new mega-project takes, it include jam space at rock bottom rates. If for no other reason, it would be nice that the tradition of making music near the intersection of St-Antoine and Rue de la Montagne continue (back in the day this is where all the major jazz clubs were located, including the famous Café Saint Martin and Rockhead’s Paradise). All this to say, the mayor’s been demonstrating a heightened level of civic engagement (surprisingly high for a Montreal mayor in my opinion) – hopefully he won’t leave major real estate development projects to market forces alone.